of New South Wales and South Australia. Depictions portrayed of her artworks are from her river country. 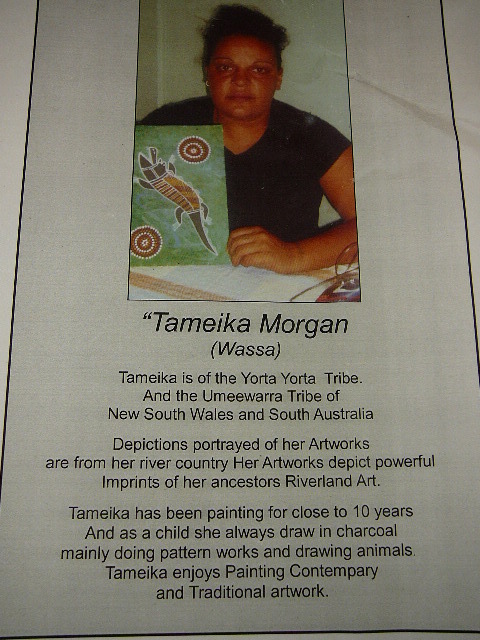 Her artworks depict powerful imprints of her ancestors Riverland Art. Tameika has been painting for close to 10 years (as of 2015). As a child she drew in charcoal, mainly doing pattern works and drawing animals. She enjoys painting contemporary and traditional artwork. These works are original paintings, acrylic traditional dot style painting, on canvas; unframed. EACH MEASURES 11-1/4" long x 8-3/4" wide. Paintings can be turned either way, your choice. All are signed "W '09" for her Wassa name, and the year (2009) in which she painted these.